KATYA IS ROCK AND ROLL’S LOVE CHILD! KATYA is a first generation, Los Angeles native, Russian Freedom Rocker. She is an astounding singer, songwriter, performer, musician and book author. KATYA toured Japan for the forth time. She performed at the Hard Rock Cafe Osaka, Hard Rock Cafe Universal City Walk Osaka, Tokyo and the Kansai Music Conference. 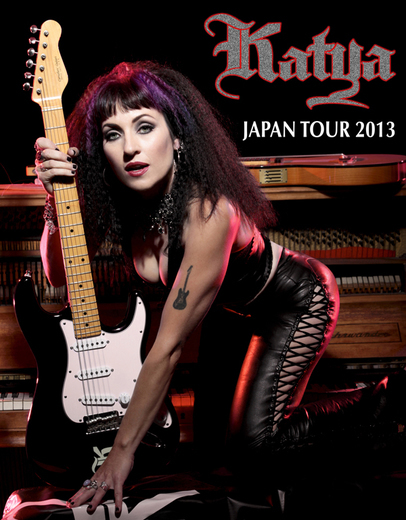 The Kansai Music Conference nominated KATYA for the “Hiram Bullock Award” and the “Performer of the Year Award”. Her fifth tour to Japan is booked for the fall of 2016. KATYA opened for Queensryche in Detroit, MI. She was invited to play the world-famous Venice Boardwalk Carnevale Festival, where her performance drew comparisons to 70’s Rock Icons. She rocked the Inkslinger’s Ball at Angel Stadium of Anaheim. Later, KATYA headlined at the E World Music red carpet launch party at the Knitting Factory. Her roots are Russian and her music is revolutionary. KATYA’s music career started at the early age of 5, when her grandmother insisted on giving her classical piano and voice lessons. She was born in Ossa, Russia and was a trained classical pianist and singer. At age six, KATYA’s interests expanded to the guitar, which led her to be a songwriter. The keys to the golden kingdom were granted, and KATYA’s whole world became about music. Today she is an accomplished musician playing piano, keyboard, rhythm, and lead guitar as well as being an incredible vocalist and a high-energy performer. Connect with this amazing artist and experience her transforming and extraordinary music!